Our house: Narrow, three cement floors, all cement walls. In short, one under-powered WiFi unit as provided from the ISP just didn’t cut it. Range extenders have been around forever, but, the loss of bandwidth between units was not desirable for me and I don’t feel like reconnecting or waiting for my device to reconnect just because I went to the kitchen. 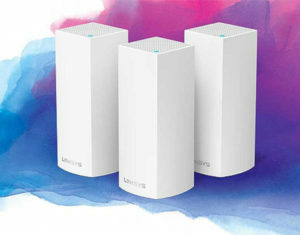 I’ve heard about mesh wifi for a number of years now, but, haven’t had the need until we started working on the connectivity in our new home. Enter: Mesh WiFi. Yes, there are MANY contenders such as Google Wifi, Netgear Obri, Eero and more but after my research, Velop seemed to be the winner due to it’s 3-band super strong antennas, easy setup, and ability to hack my way around if desired. Setup: Man, so easy. Plug in one to power, connect it to the ISP’s router via Ethernet (cat-5) cable, turn it on and use the downloaded Linksys app (on my iPhone) to set it up. There’s a multi colored LED on the top that let’s you know the status and, in reality, the Linksys app is pretty good. I followed the instructions and a few minutes later the first node was up and running. The app said, “want to set up another node?” … I said, “sure!” and followed the instructions. The second node took a bit longer to run through the setup, but, it did eventually complete and I had two nodes up. Repeat for the third node and done with my first setup. Coverage: Ok, so, this is where I was worried… I put the first unit in the same place that I have my modem. With my modem, I was only about to get a fairly week 5G signal in my office, but, the Velop node give me PERFECT signal. I got FULL bandwidth where before I barely could see the signal at all. Mesh: The part that made me want to go with mesh in the first place is that I don’t have to connect and reconnect just because I move around the house. So, I tested it. I could literally walk all around first floor and second floor with NO interruption. There is one place on second floor that the signal gets a bet week, so, I’m about ready to purchase another 3 pack and get things running in the dark corners as well as third floor. Mesh is cool, what can I say. TL;DR … Velop Mesh WiFI works like a charm in a really hard to cover cement house with 3 floors. I haven’t tested the other brands, but, I’m super happy with Linksys Velop as of right now. Good stuff, seriously.